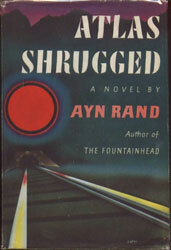 I am flying to New Orleans just now, but wanted to share my thoughts on Atlas Shrugged, the movie, which we saw yesterday, and Atlas Shrugged, the book, which I finished this morning, just as I was boarding. The movie was great; not Avatar / When Harry Met Sally / Almost Famous great, but solid entertaining on several levels. Especially for a low budget affair they did a nice job of bringing a long complex book to the screen, with good characters true to their literary counterparts, and a decent script. They also pruned the story back to the essential elements, there were only a few gratuitous plot devices thrown in to satisfy book fans. (The worst part of the movie: they botched the subplot of Dagny's Reardon Metal bracelet!) I thought the actors were great; in particular Taylor Shilling was exactly as I pictured Dagny Taggart, and Grant Bowler was a perfect Hank Reardon, and overall the politico-philosophical message was woven through and communicated. I might not see it again and again and again - there is no spectacle in the movie, it merely illustrates the book - but I liked it. And I love that critics hated it but audiences loved it; for a film which cost $15M to make, it has repaid its producers many times over. The biggest drawback is that it was Part I; the story was just getting started when the movie ended. Onward to Parts II and III. Meanwhile the book was great, as great as a book can be; full of ideas and thought provoking and world changing. If you haven't read it since college you should read it again; the messages will speak to you in a way they didn't then; you are [probably] older, and it is [probably]a different time. It was a long book but never boring, you knew where it was going but never how it would get there. On Facebook I posted this quote: "I trust that no one will tell me that men such as I write about don’t exist. That this book has been written - and published - is my proof that they do. - A.R. 1957." Indeed. Wow. And so today will be the first day of the rest of my life.